Here’s a little story about white nationalists and free speech. You might have noticed recently that DYVRS was off the air for a bit and lost a post about Garry Hume and the Party for Freedom. On the Facebook version we redacted the surnames and did not make reference to them in the post. Which if you think about it, given it was a screengrab of a public post on another page, would seem redundant, but such is the nature of lopsided social media censorship. It was certainly a matter of public interest to the people of Eltham and surrounds ,that the man who was instrumental in bringing the Party for Freedom and their entourage of violent mutants to the town, had only now, had a moment of epiphany that the PFF, were in fact, sociopathic thugs, by and large. This apparently caused not a moment of self-reflection for Gazza; if he comprehended the irony of calling out the PFF as bullies – quelle suprise! – he showed not a hint. Of course we played it for maximum schadenfreude humour and Garry’s response was, predictably, to attempt to intimidate us by outing someone he thought was the author of the post. As with everything else, he was of course wrong. 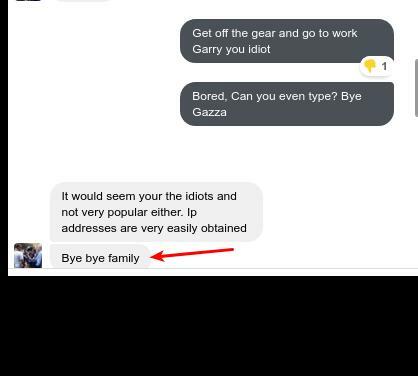 “Bye bye family” an unequivocal attempt to intimidate and a clear threat! So here you go Garry, a glimpse into your future ; Article s.474.17 of the Criminal Code—using a carriage service to menace, harass or cause offence – The maximum penalty for using a carriage service to menace, harass or cause offence is 3 years’ imprisonment. However, fai ling to get his way with threats to the families of admins Garry then decided legal threats would be the way to go. We’re not sure what fantasy you are acting out Garry, but if one could simply wave a wand and silence every newspaper and every commentator for quoting someone’s words back to them and expressing an opinion therein, then every media outlet, comedian and media commentator would be finished tomorrow. Thankfully we don’t live in your sick fantasy world. However, this raises the sad paradox of white nationalists everywhere you go – when they’re touting hate and lies they claim an almost divine mandate to disseminate that hate anyway they want. Free Speech! free speech! comes the claim if they are challenged, sometimes even erroneously referring to the non-existent free speech provisions in our constitution. Yet hold them to account for their speech, hold their words up for examination or challenge the rubbish they spew forth and their love for free speech magically evaporates. Like a narcissistic child, what they want is their right to speech without challenge or contradiction, never considering for a moment that universal free speech means just that – free speech for all – even for the “leftards” you proclaim your hatred for Garry. Which is why Garry, having momentarily departed from his commitment to freeze peach called out his creepy little “friends” (friends this week anyhow) to report our post. For those who have not encountered Facebook reporting algorithms, if enough people report a post for the same thing and the reporters get lucky, the post will be deleted and the page censured without any human oversight whatsoever. There is no mechanism to appeal nor remedy the situation by any means. Unfortunately for Garry, Facebook doesn’t operate here, I guess he’s back to suing us hey? It’s also interesting that Garry thinks we spend our time following him around the internet. Sorry little G; narrow minded bigots are just not that interesting. 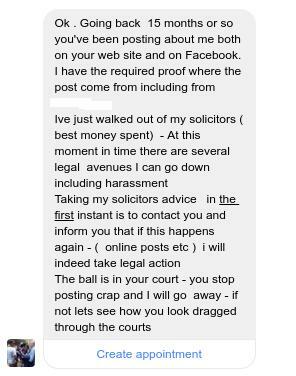 Although we must admit we have an extensive library of Garry’s posts going back well before he became locally infamous, the overwhelming majority of the material was sent in by members of the public as offended by Garry’s behaviour as we are. Seems they don’t like you either. You’d think given Garry’s upcoming legal difficulties on the 8th of June, when he’ll answer to charges of affray and riotous behaviour, he might not be issuing legal threats. Particularly given that he has found it necessary to create a Facebook page Patriot Help and is touting for donations for his legal defense. An interesting telling of the evenings events! Whatever actually happened that night, Garry’s defense fund isn’t a roaring success. We’re pretty sure Garry’s in contravention of Paypal’s T and C’s, no doubt we’ll know soon enough.